Barbara Hulanicki has quite a story. She is a stylish vision in all black from her Puma sneakers to her black leather jewelry, nails, oversize tinted glasses, leggings and jacket. She is still designing and sketching every day, finding amusement in watching trends come and go and come around again. Artist Barbara Hulanicki with Rolando Chang Barrero and an attendee to the recent "High Gloss" exhibit opening night, July 14. / Photo WPB Magazine. She was the Queen of the Swinging 60s and 70s with her hip London shop Biba. 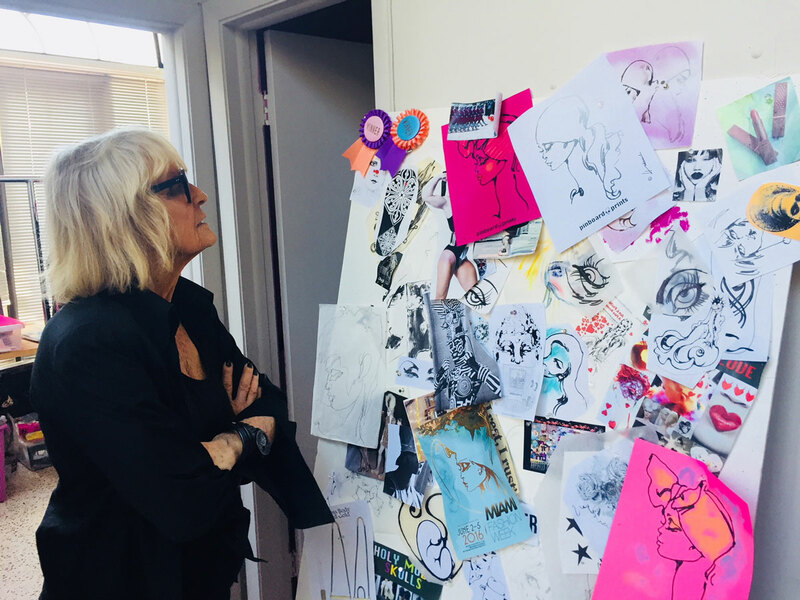 From dressing Twiggy, Brigitte Bardot, David Bowie, Marianne Faithful and the Rolling Stones, Barbara Hulanicki made her name with the cult fashion brand she started with her husband Stephen Fitz-Simon (“Fitz”). In the 1980s she moved to Miami at the request of Rolling Stone Ron Wood who asked her to design the interior of his new nightclub Woody’s on the Beach. From there she has continued to remain relevant and design hotels, furniture, wallpapers, fabrics, clothing, and art in the form of her cheeky fashion illustrations. 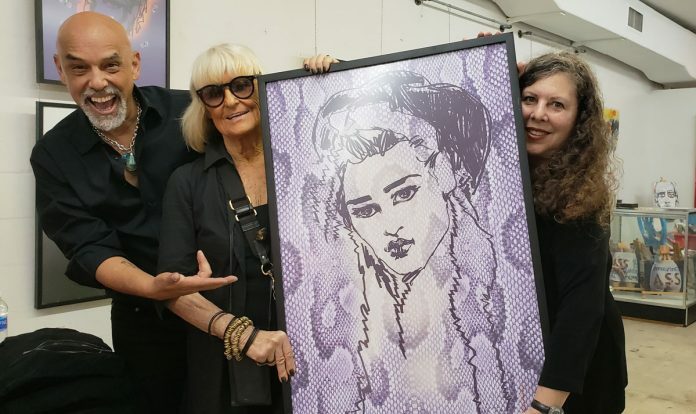 Now Barbara is being honored with an exhibit and documentary screening at The Box Gallery through August 10th along with other South Florida artist designers. She has quite a story – growing up in Poland, her father was assassinated, forcing the family to flee to England where she eventually worked as a fashion illustrator after studying at Brighton Art College in the late 1950s. She married advertising executive Stephen Fitz-Simon and they soon opened a mail order clothing company that she named Biba’s Postal Boutique. Biba was the nickname of her younger sister Biruta. The mail order gingham dress with matching kerchief was such a hit they opened a store in Abingdon Road in September 1964. After a few moves they eventually landed a six-story Art Noveau boutique where she designed everything from makeup to shoes for a new youthquake generation that was not being catered to. BIBA remains one of the most evocative names in British design history, Biba brought the cutting edge of couture to the masses. Brigitte Bardot, Yoko Ono and Princess Anne shopped there, while Sonny and Cher, Mick and Marianne were regular visitors among other celebrities and everyday women who fell in love with the clothing which would define an era. The Victoria & Albert Museum in London now houses BIBA clothing and artifacts as BIBA represents an iconic and historic image of a bygone time. Real estate and economic upheaval ended Bibas reign. In 1987 she landed in Miami Beach when Rolling Stone Ron Wood asked her to design his new club Woodys on the Beach which she decked out in silver furniture and swirling neon accents. Then Chris Blackwell of Island Records had her design his new recording studio/hotel The Marlin, festooning the lobby in an undersea watery theme of wavy chairs and seashells on the walls. 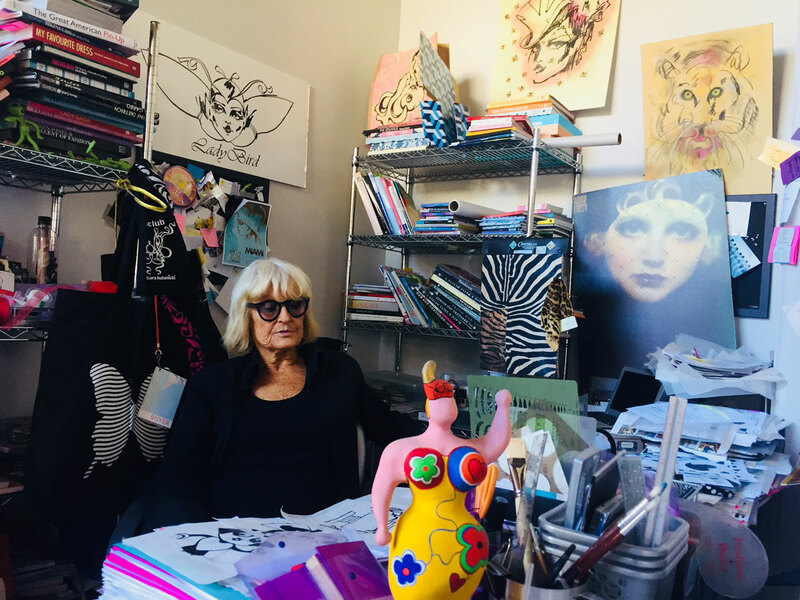 Sitting in the Collins Avenue building where she has lived and worked for decades, Hulanicki is surrounded by 60 years worth of memorabilia, although it is very much a working design studio. Posters from Biba’s golden era sit next to adverts for her recent design line of dresses and flirty tops for TopShop. Art Deco swirled pillows and t-shirts adorned with butterflies hang in racks in the back room. Hulanicki is a stylish vision in all black from her Puma sneakers to her black leather jewelry, nails, oversize tinted glasses, leggings and jacket. She is still designing and sketching every day, finding amusement in watching trends come and go and come around again. Her memory is sharp as a tack and she has marvelous stories of the highs and lows of the designers life. A documentary made on her called Beyond Biba shows her well shod path from Poland to Miami, with cameos from Twiggy, Kate Moss and Ron Wood. The film will be shown at an exhibit honoring her decades in fashion and design at The Box Gallery’s High Gloss 2018 show. Hulanicki will be exhibiting her large framed fashion illustrations as well as new designs for vinyl wall art that comes in strips of four, t-shirts and bags with a lip print, plus something clever she calls Pinboard Prints – printed fashion illustration drawings she will be hand coloring at the exhibit. “Beyond Biba”, a documentary and music video filmed at Bibas Rainbow Room Club screens July 21, 7-9 pm. If you visit, The Box Gallery is located at 811 Belvedere Road. For more information and exhibits, visit www.theboxgallery.info.